What in the World Is Jackfruit? Jackfruit is a weird-looking but delicious fruit that’s popping up on store shelves and restaurant menus alike. Fans say it’s the perfect swap for pulled pork, shredded chicken, and even beef brisket. It has a mild flavor that melds well with a variety of seasonings, and it’s stringy (in a good way) so it shreds easily. New to jackfruit? Get the scoop on this tasty faux meat. Where does jackfruit grow? These giant fruit — they’re the largest tree fruit in the world — are native to South and Southeast Asia. Jackfruit recipes can be found in Indian, Thai, and Balinese cuisine, and jackfruit happens to be the national fruit of Bangladesh. Ripe jackfruit is consumed as a meal or side dish in places like Sri Lanka. The fruit has a thick, spiky skin that starts out green and then turns yellow with darker spots. Jackfruit won’t have much of a scent when it’s green, but it smells sweet, musky, and fruity when it’s ripe. “When I was living in Bali, I would enjoy sweet, ripe jackfruit as a treat with my breakfast,” says Krista Haynes, R.D., C.S.S.D., and nutrition manager at Beachbody. Green jackfruit, which is the type used as a meat swap, has a taste and texture similar to artichoke hearts. 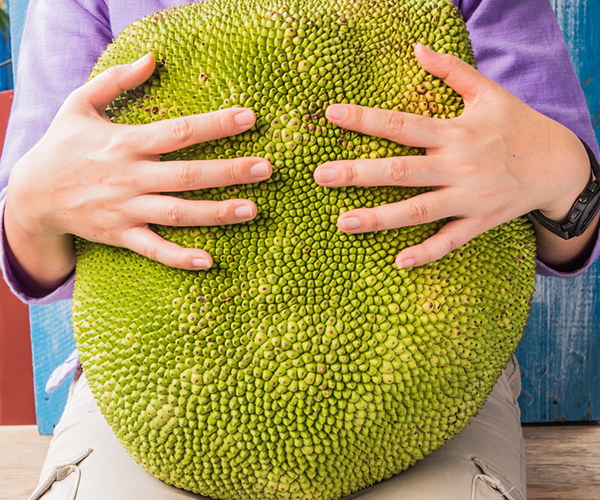 Though the young, green jackfruit is what’s hot right now (it appeared on the 2016 food trends list from Google), you can also find ripe whole jackfruit or cans of it packed in syrup at Asian markets. While jackfruit is popular as a meat stand-in, it doesn’t contain much protein — so that’s not one of the benefits of jackfruit. 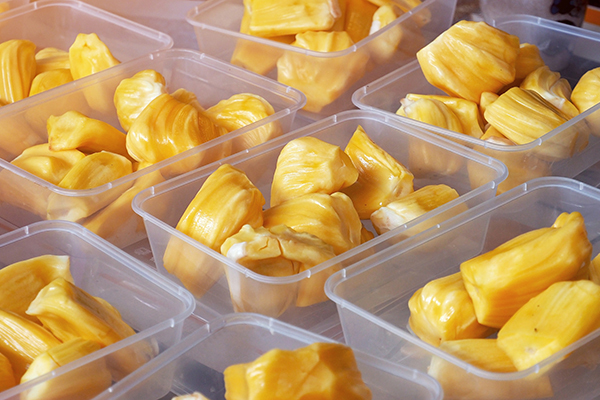 Each ½ cup of jackfruit pieces contains 72 calories, 1.3 grams of protein, 18 grams of carbs, and 0.5 grams of fat. “It also contains calcium, magnesium, vitamin C, and potassium,” says Haynes. Though jackfruit has been touted for its ability to “feed the world,” you don’t have to make this a new staple in your healthy diet. “I wouldn’t say jackfruit is a superfood that should be included in one’s diet to boost your health,” says Haynes. If you’re following Portion Fix, a serving of plain green jackfruit is ½ cup (or 4 ounces) and would count as one purple container. Another benefit of jackfruit? “It’s naturally high in fiber,” says McKercher. Ready to learn how to eat jackfruit? You have two basic options: Find a whole, unripe jackfruit and prep it yourself (we’ll teach you how), or buy a can or package of plain green jackfruit in brine (a much easier option). Though you can find jackfruit that’s pre-seasoned, “be mindful of the added sugar and salt,” cautions Haynes. Since jackfruit is not as high in fat and protein as pulled pork, your jackfruit pulled pork recipe won’t keep you as full as the real deal, so you will want to include other foods that provide those macronutrients. If you’re new to cooking jackfruit, try this healthy barbecue sauce recipe, and serve it with avocado or another healthy fat to boost satiety and mouth feel. Add a layer of flavor by pan-frying your jackfruit in a nonstick skillet before adding sauce. To get some color on your jackfruit, pat it dry before adding to a hot pan with a small amount of oil (optional). Note: If you’re using jackfruit in any Portion Fix-approved recipe, adjust the container calculations based on your swaps. Use in place of crab in your favorite crabcake recipe. Swap for the shredded pork in these tacos. Take out the tuna in this Tuna Salad Sandwich, and add jackfruit. Toss jackfruit with this rich mole sauce. Season jackfruit with your favorite taco seasoning, then serve with black beans, fajita veggies, and this Vegan Cashew Queso Sauce. Jackfruit is not just for vegans and vegetarians. If you’re not looking to adopt a plant-based diet, try one of these jackfruit tips for meat eaters. Haynes thinks it’s a great idea to add more fruits and veggies into your diet and cut back on high-fat meat consumption. “Replacing one or several meat-based meals per week has been shown to improve one’s health,” she says. For example, the Mediterranean diet, which is considered one of the healthiest in the world, doesn’t include much meat. You could also integrate jackfruit into a flexitarian diet. “Jackfruit can be included as part of a healthy diet rich in other fruits and veggies and plant-based proteins and healthy fats,” adds Haynes. Cover your work surface with newspaper or dishtowels. Put on an apron or old clothes. Rub cooking oil (like coconut or olive) on your hands and/or wear rubber gloves, as the jackfruit contains sticky natural latex that will make a stringy mess. Slice the fruit in half using a sharp serrated knife, then slice it into manageable pieces. You may want to oil the blade of your knife to keep it from sticking. Boil until tender (if you have thin slices, this takes as little as 10 minutes — thicker chunks could take up to 45 minutes). Once you’ve processed the entire fruit, you can proceed with your recipe as planned. Jackfruit is a delicious vegan swap for pulled pork and other shredded meats. In Portion Fix, it counts a fruit portion. Jackfruit is higher in carbs and lower in protein than the meat it may be replacing in a recipe, so pair it with a vegetarian protein like pulses. The taste and texture may not completely fool meat eaters, but they can benefit from adding shredded young jackfruit to dishes as a way to eat less meat. The easiest way to eat green jackfruit is to buy it canned or packaged, but you can also process whole jackfruits, too.